Micello is joining HERE Technologies! We are excited to share the news that Micello is being acquired by HERE Technologies! We're excited to join HERE and for the opportunity to scale globally with partners all around the world. Once the transaction closes, we will join the Venue Maps team as part of the Internet-of-Things business unit and continue our mission of mapping everything indoors. Over the past few years, we've focused on growing the Marketplace - solutions and integrations developed by our partners around the world. Thank you to everyone who has supported Micello. We are grateful to have had the opportunity to push the boundaries forward in location and mapping technologies. For more information, please read the press release and Ankit (Micello CEO's) thoughts. We started on the Micello journey over 10 years ago to map everything indoors. We're incredibly honored for the love and support we received over the years and would like to extend a warm thank you to all of our customers, partners, current and former team members, company advisors, friends, and family. You have all contributed to Micello's success and cheered us on through our journey, and left encouraging messages on our office walls. 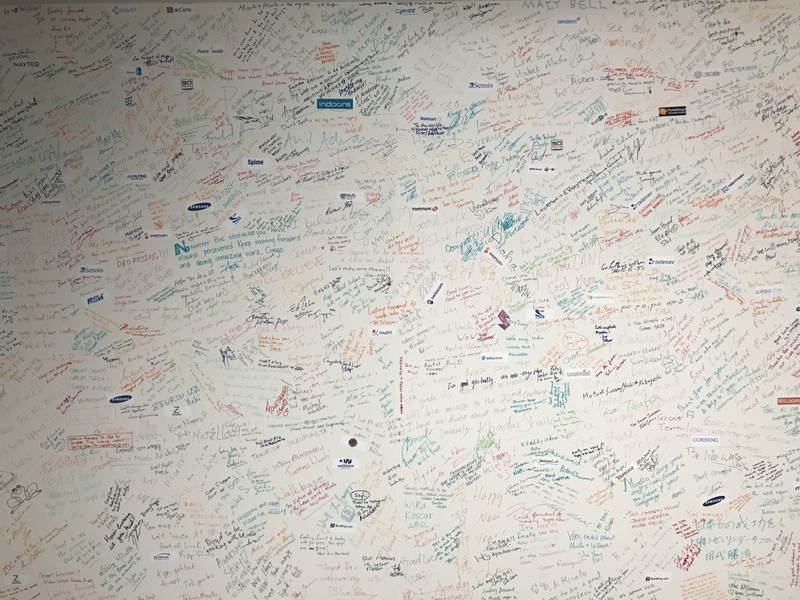 In the day-to-day and tough moments, this signature board served as a wonderful inspiration for all of us and encouraged us to keep pushing forward. From the Micello team, thank you, and as always, "happy mapping!" I’m a Micello customer. How does this change impact me? Thank you for being a Micello customer. First, it is business-as-usual. Micello's integration into HERE will have no impact on how you work with us. At any time, you can request new indoor maps, update existing maps and continue to use the data through our Marketplace partners. Over time, you’ll see Micello more deeply integrated into HERE and you will have access to more resources and support from the team. Also, we’re doubling down on the vision to grow the Marketplace and you’ll find us launching more integrations faster than ever before. We have an incredible line up of new partners in development for 2018. Is the Micello pricing changing? Nope! We value your business and want to make this new integration a success for you as much it is for us. We will not be changing any of our pricing policies or structure. You will now have access to more resources and dedicated teams as well. Will the pricing for Marketplace partners change? For partners, joining the Marketplace has always been free, and that’s exactly how it will continue. I’m a partner in the Marketplace. How does this change impact me? Thank you for being a Micello partner. All the Micello platform APIs will continue to be supported. There are no changes required in your solution and its business-as-usual. Over time, you’ll see a few things. First, we’re immediately hiring to further grow the partner management team. Second, we will continue to innovate with more APIs/SDKs in the platform with more features and capabilities. As much as possible, we’ll be sharing our product roadmap for your feedback. I would like to join the Marketplace. How can I get started? The Marketplace is free for partners. Please contact us and we’ll get in touch with you as soon as possible. I’m a Marketplace partner. Does our partnership agreement need to be updated? Nope! The partnership agreement has been taken over by HERE. How will HERE help grow the Marketplace? HERE is doubling down on the Marketplace as the go-to-market strategy for indoor maps. We’re going to leverage HERE as much as possible to identify, integrated with and launch new partners. What’s going to happen to micello.com? Micello.com will continue in 2018 and will be transitioned over to a brand new customer portal on HERE.com. How will Micello support continue to operate? Are any tools or products changing? What are the plans for 2018 and beyond? The product roadmap is completely full. We’ve got a million things to work and are excited to expand the product portfolio. Please contact us for more specifics. How long will the Micello products be supported? All Micello products will continue to be supported and in many cases, expanded with new features and capabilities. I need to update the maps. Does the process change? Nope! Please update the maps in the usual process of sending new floorplans, using our annotations tool or using the real-time map editor. How did Micello get started? It’s a fun story. Please visit the Our Story. Why did you sell Micello to HERE? The terms of the acquisition are confidential, but please reach out to the Micello team and we’ll take you out for a celebratory drink! What’s happening to the Micello team at HERE? All the Micello team members are joining HERE and will continue to operate from their respective office locations. I am interested in joining the team. How can I apply for a role? We’re hiring. Please contact us and tell us a little more about yourself. We are recruiting for engineering, sales, operations and partner management roles immediately. I have more question that’s not listed here. We’re always happy to help. Please feel free to contact us or reach out to your account manager.